Radio Waves have the lowest frequency in the EM Spectrum and the longest wavelength: their wavelengths are on the same scale as mountain ranges! They are very low energy and so not dangerous. They are used in communications. Radio waves are refracted through the atmosphere (that's why there is a curve in the picture on the right) and reflected by the ionosphere so that radio messages can be sent around the world. 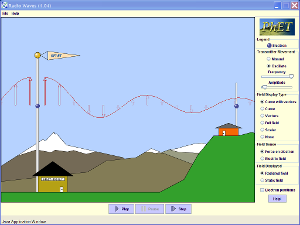 Both microwaves and radio waves are used in communications: radio waves for radio and microwaves for television and mobile phones. We are going to compare them. Radio waves are reflected by the ionosphere but microwaves pass straight through. 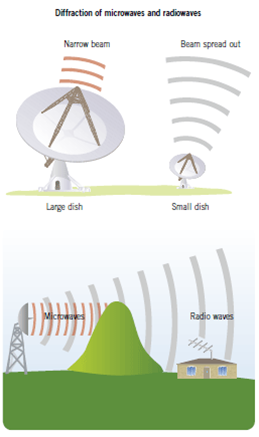 Radio waves can pass messages between receivers on Earth but Microwaves and so television and mobile communications must be reflected off satellites. If you look at the diagram on the right, you can see that radio waves diffract a lot more than microwaves. This is because microwaves have such a small wavelength. You may have noticed that you can sometimes get radio reception in a valley but not mobile signal. This is because the radio waves are large compared to the hill and so can diffract around it but the microwaves are tiny compared to the hill so are blocked.